Click Here for 2019 Sponsor Opportunities! There was a fantastic Thank You party following the 2015 event at the Oasis, 6550 Comanche Trail. Volunteers received a free t-shirt, lunch, and many won awesome door prizes! Jessica was swept away while checking a low water crossing in her patrol car on September 18, 2014. She loved the Lake Travis Cleanup and 2014 was her second year participating. We will miss her very much. 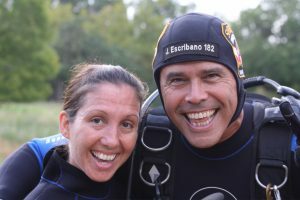 Jessica is pictured below with Travis County Sherrif’s Office Lake Patrol Dive Captain Jose Escribano. Here’s our 2014 photo album! View our online photo album for the 2013 event!